Herb Hesse was born in Cold Spring, Minnesota in 1920. He was number 7 of 13 children in his family. 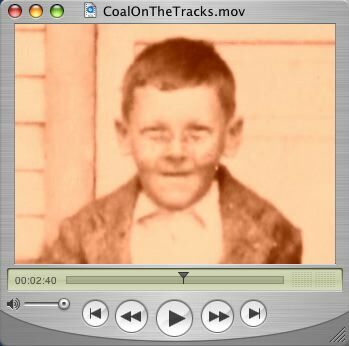 In this story Herb tells about walking home from school along the railroad tracks hoping to find chunks of coal along the way. As the train would roll by on the tracks, chunks of coal would often bounce to the ground from the coal car right behind the locomotive. Herb lived in a home that was typical for the times. Paper thin walls and a wood stove as the primary heat source during the winter. Herb tells about using coal in the wood stove as a way to keep the fire burning longer into the night. This story is about a local Santa Claus who gives the gift of coal to a freckled faced little boy that wanted his family to stay warm on a cold winters night. This is a story that will touch your heart and soul during this special time of year. "Yeah, it was kind of tough. Things were really bad during the depression. But we somehow survived." said Herb Hesse. Those were some pretty bitter cold winters when I was a kid. We never had dry firewood that would burn decent. Instead the wood was always green and caused problems both starting and burning. Those days the railroad locomotives were all running on coal. I remember coming home from school this one evening after staying later than normal. It must have been closer to 4:30 or 5:00 pm when I left school and got down to the train depot. I walked the Great Northern railroad tracks looking for chunks of coal along the way. As I was walking along not finding a single clump along the way, Frank Ash, the depot agent, a very good friend of the family, stopped me and asked what I was doing? "Mr. Ash, I'm looking for some coal." said Herb. "No" said Herb. "We must have picked it all up the last time we walked the tracks. Mr. Ash, it gets so cold in our house in the morning when the fire goes out at night. The wet wood we have just doesn't make it through the night so we try to find coal to help keep the fire going longer." Now Mr. Ash didn't know that while I had been walking the tracks that day I had passed a brand new coal car plump full of coal waiting to be loaded into the coal bins. The coal car was locked tight and not a single piece of coal was anywhere to be found around it. "I tell you what we'll do Herb," said Mr. Ash. "You go home and after supper tonight, you and your brother Carl get out your sleds and come on over to my house. You bring along some orange crates on top of your sleds and we'll go searching for some coal." So my brother Carl and I loaded up our sleds and headed over to Mr. Ashes house which was only about a block down from the railroad depot. Mr. Ash was waiting for us and soon had us headed down the path straight for the coal bins. As we approached the coal car I had seen earlier that afternoon, there to my surprise, laying on the ground right below the locked door I had inspected earlier, was enough chucks of coal to fill both Carl's and my sled. Carl and I quickly gathered up all of the coal, thanked Mr. Ash, and headed quickly home to show Mom, Dad, and the rest of the family, what we had found. As I look back at that evening today, it's obvious that before Mr. Ash called it a day, he had unlocked the coal car and purposely threw out enough coal to fill up our sleds. Mr. Ash was a kind of Santa Claus at our house that year. As a kid his kindness warmed my toes and fingers in the cold of winter, and today the thoughts of him continue to warm my heart this holiday season. This story was also featured on our affilate Vlog site Minnesota Stories.